Bread Of Life: Friday, May 3rd, 2019. See More Below. Food Is First: Sunday, May 5th, 2019. See More Below. 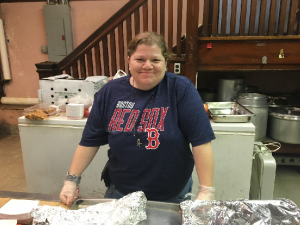 Melrose is often thought of as a comfortable suburb of Boston, but we understand that many people in our local communities lack access to nutritious food and spiritual support. MUUC strongly and consistently supports local ministries working to meet basic nutritional needs of people in our community. Our Hunger Ministries include supporting Bread of Life, our Food Is First program, our Giving Beyond Our Walls program, and recently creating school vacation week food boxes. Bread of Life is a faith-based ministry, serving the communities north of Boston by feeding the hungry, homeless, needy and isolated; offering spiritual nurture, support, and hospitality; promoting greater peace and justice by addressing broader issues of hunger, poverty, and need; and conducting their work in a spirit of respect and nonviolence. The Melrose UU Church serves about 8 meals throughout the year, about 50-75 guests per meal. All Bread of Life locations are accessible by public transportation. CLICK HERE for details about dates, times, locations and tasks for upcoming Bread of Life events. Pantry of Hope is a food pantry organized and run by the local First Baptist Church in Melrose. To support the Pantry of Hope, on the first Sunday of every month during the church year, MUUC has a “Food Is First” effort. This means MUUC’ers bring shelf-stable food and non-food items (such as toothpaste, tin-foil, etc.) to the church before worship service, and leave the bags of items in “Brick Hall”, which is our main entrance hall. Volunteers bring the donations from our church to our neighboring First Baptist Church the following Monday. First Baptist sees to the distribution for our neighbors in need. MUUC has been “Giving Beyond Our Walls” to support the work of many vital organizations for years, including many that deal with hunger issues. Check out the Giving Beyond Our Walls page on our website. In 2016, a need was identified during the February and April school vacations, as some families struggled to feed their children who would otherwise receive free breakfasts and lunches at school. MUUC organized efforts to raise money to provide vacation week food boxes for families who live in motels in Melrose and Malden. Food was purchased and MUUC’ers assembled the boxes, which were then delivered directly to the families by Bread of Life; these boxes contained kid-friendly, nutritious, and shelf-stable food requiring little or no preparation. Thanks go to our Hoover School helpers, and Brad Hutchinson Real Estate, who donated the use of a van to transport the boxes. We are grateful for the many generous donors who exceeded our fund-raising expectations. 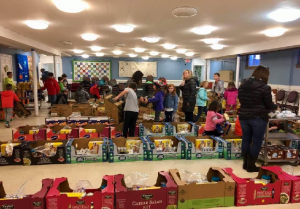 Successful 2016, 2017, and 2018 School Vacation Food Box events were completed! In April 2018, we were told by Bread of Life that there were no more families living in local motels at that time. More to be thankful for! All remaining funds are ear-marked for the School Vacation Food Box effort, allowing MUUC to be able to respond on an as-needed basis, as we keep in touch with Bread of Life regarding the need for assistance.